International Yoga Day (IYD) is being observed across the country on Tuesday by organizing various programmes. The Government organized a yoga programme of IYD Main Organizing Committee to mark the International Yoga Day at Durbar marg in Kathmandu on Tuesday. Speaking at the programme, Prime Minister KP Sharma Oli said that yoga is an integral part of people’s daily activities for healthy body and sound thoughts. The PM claimed that yoga originated in Nepal, referring to the traditional form of exercise practised by ancestors and scholars from time immemorial. PM remarked yoga as asset of all and thanked to those who initiated for the recognition of yoga by the United Nations. UN endorsed the proposal to observe June 21 as International Yoga Day on December 11, 2014,. Similarly, Education Minister and coordinator of the IYD Main Organising Committee Giriraj Mani Pokharel said that yoga should also be introduced from school level. Moreover, Health Minister Ram Janam Chaudhary urged all to practise yoga every day. Likewise, Indian ambassador to Nepal Ranjit Rae read out the message sent from Indian Prime Minister Narendra Modi on the occasion of the day. 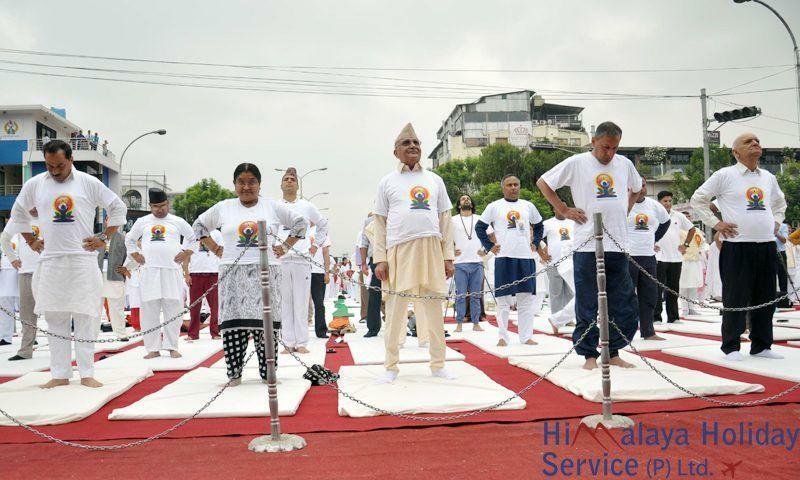 On the occasion, PM Oli, his wife Radhika Shakya and Deputy Prime Ministers, ministers, lawmakers and high level officials practised yoga for an hour. Moktan has been recognised by Guinness World Records for continuously practising yoga for 50 hours and 15 minutes on December 17-19, 2015. Similarly on the occasion, the PM launched three books on yoga; ‘Tapai Ko Lagi Yoga’ authored by Dr Raju Adhikari, ‘Bichar Kranti’ published by Patanjali Yog Peeth Nepal and ‘Yoga Sandesh’ (Yoga for peace and harmony) by Nepal-based Indian embassy.